In his postgame interview Seattle Seahawks head coach Pete Carroll announced left tackle George Fant suffered a season-ending ACL tear in Friday night’s game against the Vikings. Fant took over as the Seahawks starting left tackle mid-season last year. Fant had a rough first year as a starter, grading as the worst tackle out of 76 qualifiers while earning an overall grade of 30.2. 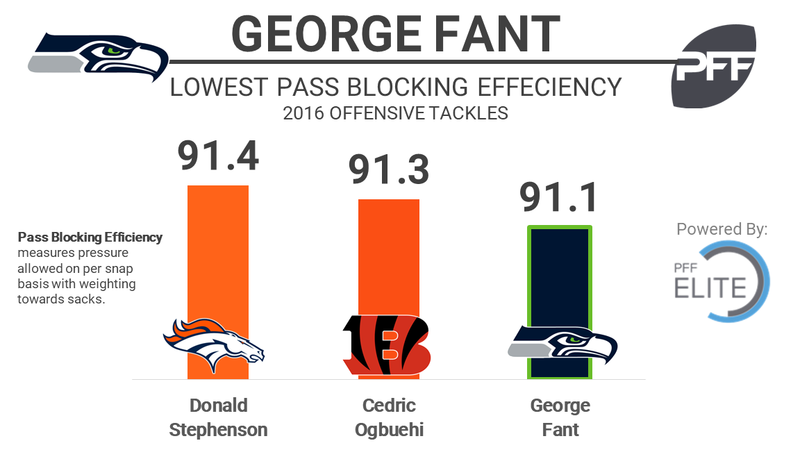 Fant was poor in pass protection, earning the third-lowest pass blocking efficiency at 91.1. He allowed 47 pressures including seven sacks on just 414 pass-block snaps. Rees Odhiambo, normally a guard, joined the first-team offense in Fant’s absence against the Vikings. He performed well considering the circumstances, earning a 71.8 overall grade. Odhiambo played 13 snaps at left tackle in 2016.